The applicant can be reimbursed up to fifty percent--or up to a maximum of $30,000 - once construction is complete and the terms stated in the Reimbursement Agreement have been met. All the improvements must be visible from the public right of way. Please scroll down for area boundaries, maps and the respective project managers for each area. For general information on both the Façade and Tenant Improvement Programs, please contact Kimani Rogers at (510) 238 - 6204 or krogers@oaklandnet.com. 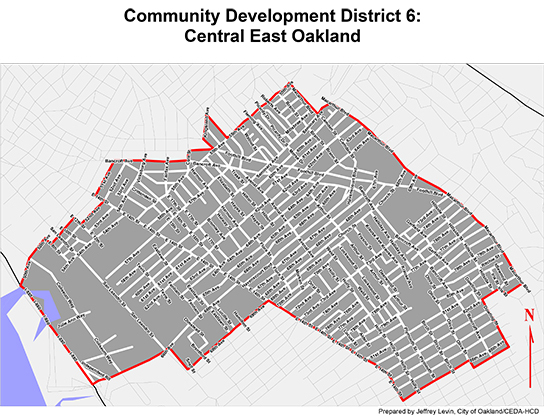 The Broadway/MacArthur/San Pablo (BMSP)Redevelopment Area comprises two distinct areas in North Oakland: the Broadway Auto Row and Telegraph Avenue between 27th Street and 42nd Street, and San Pablo Avenue between 53rd Street and 67th Street. 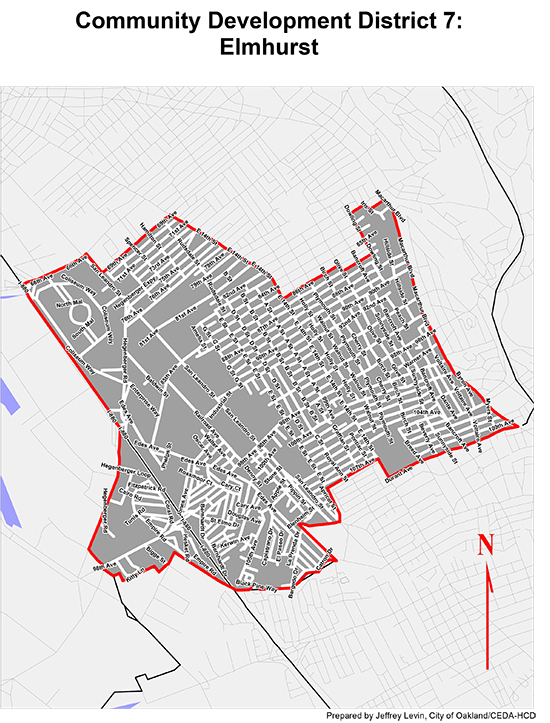 Areas shaded on this map are served by both the Facade Improvement Program and the Tenant Improvement Program. 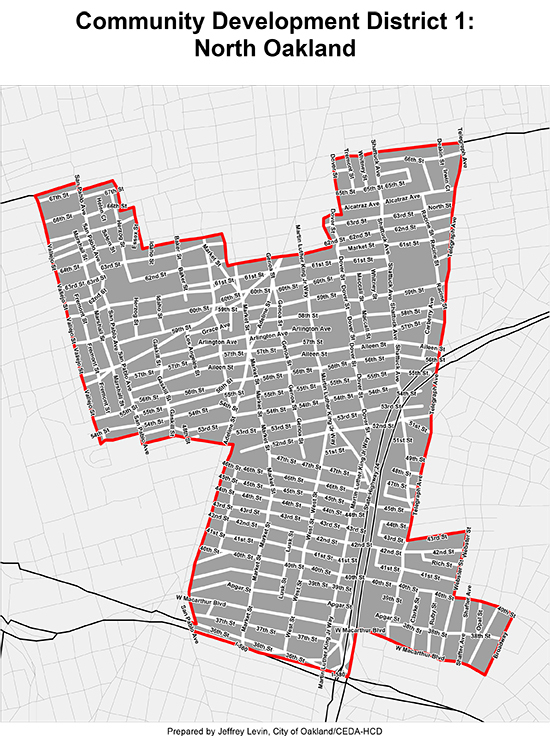 Boundaries: Broadway/MacArthur sub-area: Broadway, Highway 24, 27th Street and 42nd Street; plus Martin Luther King, Jr. Way between West MacArthur Boulevard and 40th Street. 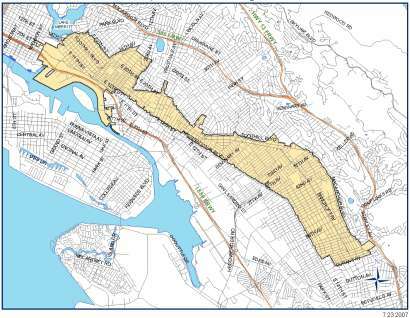 San Pablo sub-area: San Pablo Avenue and Vallejo Street between 53rd Street and 67th Street. Click here for a larger map of the Broadway/ MacArthur/San Pablo project area. The Facade Improvement Program previously provided Façade grants only within this project area. 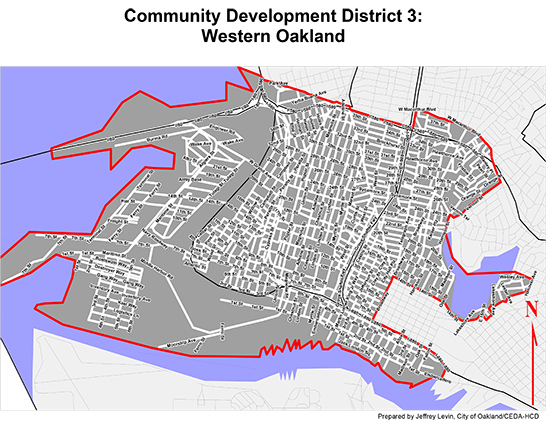 The Central City East (CCE) Redevelopment Area contains portions of the Eastlake, Fruitvale, Central East Oakland and Elmhurst neighborhoods that make up central and eastern Oakland. - Click here for a larger map of the Central City East project area. The Facade Improvement Program previously provided grants Façade grants only within this project area. To see a large map, please click here. For more information about the Facade and Tenant Improvement Programs in Central City East, please contact Kimani Rogers at (510) 238-6204 or krogers@oaklandnet.com. 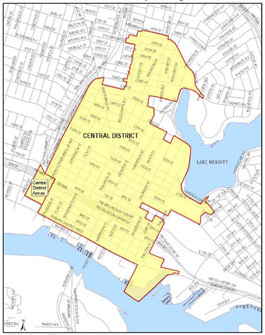 The Central District covers portions of Downtown, Uptown, Chinatown, Old Oakland and Jack London. 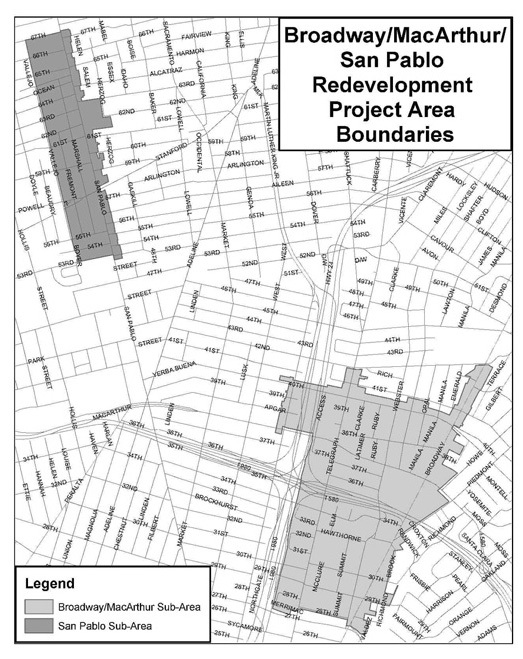 - Click here for a larger map of the Central District project area. 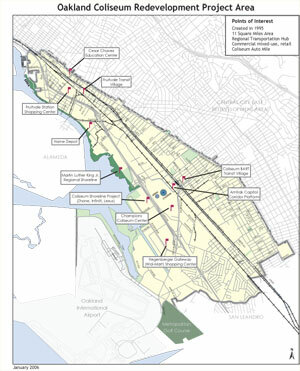 The general boundaries of the Coliseum Redevelopment Area are the San Leandro border to the south; 22nd Avenue to the north; International Boulevard to the east; and the Oakland Estuary, San Leandro Bay and Oakland International Airport to the west. - Click here for a larger map of the Coliseum project area. The Facade Improvement Program previously provided Façade grants within this project area. To see the an enlarged map, please click here. For more information about the Facade and Tenant Improvement Programs in the Coliseum area, please contact Kimani Rogers at (510) 238-6204 or krogers@oaklandnet.com. 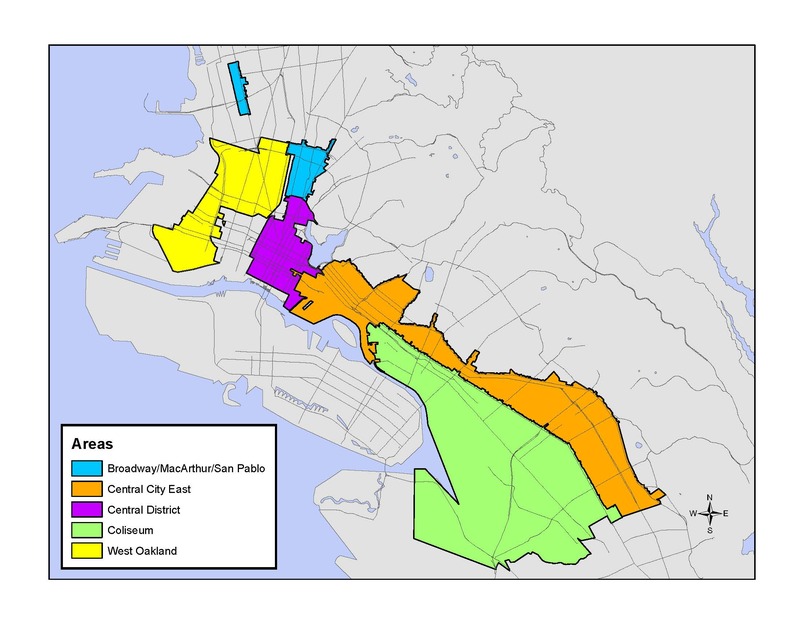 Currently, there is no additional information about the Facade Program in West Oakland.